Work has been overwhelming and this workload usually spilled to the after office hours i.e. either later at night or over the weekend. Due this circumstances, I have to really plan carefully. What time I need to allocate for cooking, for housework and for other related stuff. And my dream to be a successful blogger, which I know something I have to really work hard for. It's not impossible, just need to work hard and time management is very crucial. Saturday is an important day for me. Not only I have to complete the house chores, I also need to make sure I spend sufficient time with the cuties. It will usually start with breakfast. FYI, for those who don't know yet, my better half works on Saturday hence life on Saturday with him will usually starts at 2pm. Last Saturday, I just tapaued food, some nasi lemak and kuih. 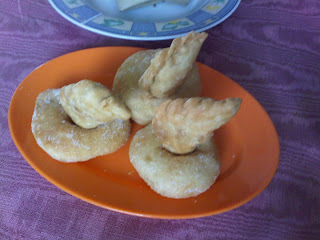 My hero helped to serve the food and this was his creation, karipap berdonut. Then, we lepaked at Subang Parade, been quite some time since we went there. Had late lunch at Yanti Rasa Thai, ordered Nasi Goreng Cina and Cantonese Kuey Teow. We were really full when we left that place, my better half was the most full one, he even had Sago Gula Melaka for desert. We hang out at MPH, I bought some books for the cuties, of course, Cleo for me. Again, lepaked at Book Cafe to get some work done using their Wi-Fi.